NASA's Kepler mission announced in December the discovery of an eighth planet orbiting Kepler 90, a sun-like star located about 2,500 light years from Earth. The discovery is noteworthy not only for the fact that Kepler 90 possesses as many planets as our own solar system, but also for how NASA made the discovery: using artificial intelligence. "Training" special AI software, developed by Google, to recognize the elusive signals produced by extrasolar planets (exoplanets), NASA set the AI loose on data collected years ago by the Kepler mission. The Kepler spacecraft, launched in 2009, searched for exoplanets using the Transit Method: looking for the slight dimming in a star's light caused by an orbiting planet crossing in front of it (transiting). Kepler continually measured the brightness of 150,000 individual stars near the constellation Cygnus for three years, beaming the data back to Earth for analysis and storage. 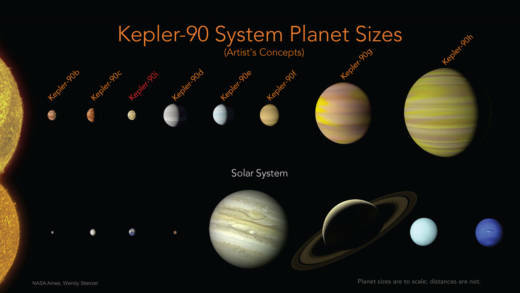 Conventional analysis of Kepler's observations ultimately revealed seven planets in the star system called Kepler 90. 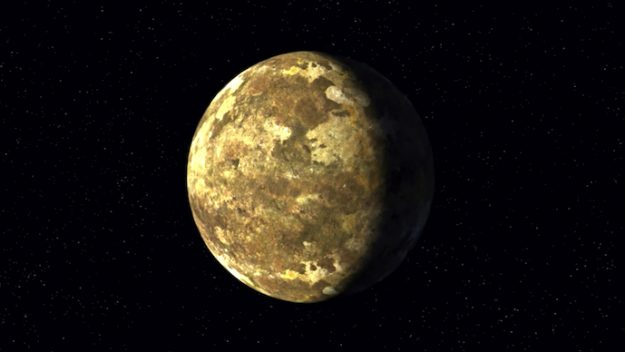 But the system's eighth planet, named Kepler 90i, went undetected--until the AI took a crack at it. Detecting the minuscule dimming in a star's light caused by a small transiting exoplanet may be likened to searching for a needle in a haystack—a monumental task for a human, though not so difficult for a well-trained, artificially intelligent computer. Once the AI learns the shape and appearance of a needle, it's just a matter of examining each straw of hay in the stack, one by one, until it finds any that look like a needle. A computer can do that kind of repetitive task without tiring, and do it very quickly. Kepler 90i is a super-Earth-sized world, with about 1.32 times the diameter of Earth. 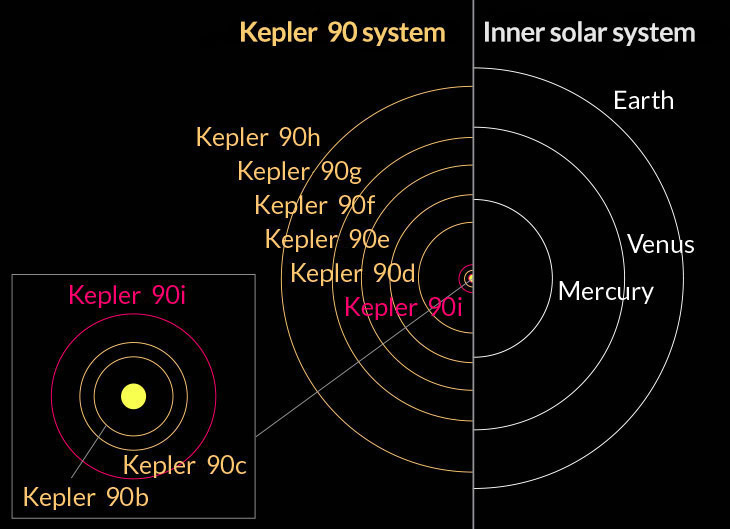 Orbiting its sun-like star eight times closer than the Earth orbits the sun, Kepler 90i's surface temperature is estimated to be 817 degrees Fahrenheit. At present, that's about all we know about it—other than the fact that it orbits its star once in less than 15 days! How Many Exoplanets Have We Found? Despite the similarities between detecting exoplanets and finding haystack-embedded needles, conventional analysis has found—quite a lot of needles since the first exoplanet discovery in 1992. As of December 21, 2017, astronomers have confirmed more than 3,500 exoplanets in 2,660 star systems, with an additional 4,500 candidates awaiting confirmation. Of the confirmed exoplanets, 2,431 of the discoveries are attributed to the Kepler spacecraft. Of the exoplanets confirmed to exist, 882 are classed as Terrestrial, or approximately the same size as the Earth. And of these Earth-sized worlds, six are located within their stars' "habitable zones," which means they're at the right distance for liquid water to possibly exist on their surfaces. These known exoplanetary systems represent only a tiny fraction of the stars in the Milky Way galaxy. Extrapolating from the abundance of planets in this small sampling, astronomers estimate there may be billions of Earth-sized exoplanets within the habitable zones of their stars. Take a breath and let that sink in…. The application of "teachable" AI software to dig through stacks of transit data opens even more possibilities for discovering elusive extrasolar worlds. Though Kepler 90i was found by fine-sifting through old data, this only means that there may be more—perhaps many more—exoplanets laying hidden on hard drives, waiting to be found. And now NASA has the AI tool to do the sifting.